Demolition contractor Brown and Mason has successfully completed the first controlled collapse event using explosives at the Rugeley Power Station site. 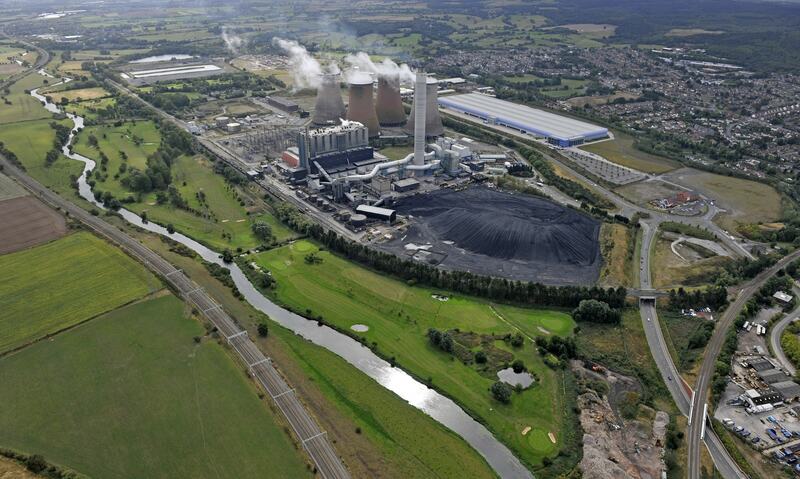 Brown and Mason are carrying out demolition works on behalf of Rugeley Power Station owner ENGIE. The explosive demolition, which took place on Thursday 14th February, brought down the large ductwork system that served the former power station’s flue gas desulphurisation plant. Constructed mainly of steel, the ductwork structure was approximately 160m long, 7.7m wide and 32m high. The blowdown event, which was scheduled to take place around 10am, was delayed for a short time by demolition experts to allow fog to clear on-site – and was completed at 11am. The collapsed structure is now being safely cleared by the Brown and Mason team. Prior to the event an exclusion zone was put in place, well within the power station boundary, ensuring there was no public access, and no impact on the local road network. The other main structures, including boiler house, chimney and cooling cowers are scheduled for controlled collapse through the remainder of 2020. The complete demolition of the site is expected in 2021. A community exhibition about the ongoing demolition of Rugeley Power Station was held at Rugeley Rose Theatre on Thursday 7th February 2019. Exhibition boards from the demolition event are now available to view here. At approximately 10am on 14/02/2019, the first controlled collapse demolition event utilising explosives will take place at Rugeley Power Station. The controlled collapse will bring down the FGD Ducting. The structure is predominantly constructed of Steel and is approximately 160m long, 7.7m wide and 32m high. To protect everyone on site and in the local area an exclusion zone will be in place before, during and immediately after the collapse. The exclusion zone is well within the power station boundary fence and there will be no public access to the area or impact on the local road network. Demolition of this section of the power station is considered to be low impact and will not be easily visible from outside the boundary fence. Although the initiation and collapse may be heard off site, any noise will be over very quickly. The other main structures, including boiler House, Chimney and Cooling Towers are scheduled for controlled collapse through the remainder of 2020. The complete demolition of the site is expected in 2021. For more information a frequently asked questions document is available here. A community exhibition about the ongoing demolition of Rugeley Power Station is to be held at Rugeley Rose Theatre between 14:00 – 16:30 on Thursday 7th February 2019. This drop-in event is open to all members of the community and will provide an opportunity to find out more about the demolition works which are currently underway. Visitors to the exhibition will be able to see a timeline of upcoming demolition milestones and meet members of the project team to discuss any questions they may have. The event is being hosted by Rugeley Power Station owner ENGIE, in partnership with specialist demolition contractor Brown & Mason – which is undertaking demolition of the power station. Brown & Mason’s Safety, Health, Environment & Quality Director Alex Hadden added: “We have demolition experience of over 50 complete power stations and therefore have the capabilities to execute every type of dismantling or demolition activity safely. We welcome this opportunity to share information about the power station demolition programme with the local community. The commencement of demolition at Rugeley Power Station follows ENGIE’s receipt of planning permission from the two local authorities (Lichfield District Council and Cannock Chase District Council) in October 2018. In line with the conditions associated with the approval, demolition contractor Brown & Mason has mobilised onsite, and work is underway removing ancillary structures along with building interiors to allow structural demolition to commence. Overall the demolition of the power station and associated buildings is scheduled to take approximately two and a half years.